Fans can expect a unique, 2 hour ACCEPT show, shot on August 3rd, 2017 at the legendary W:O:A, where the band played the biggest and most extraordinary show of their career in front of 80.000 live fans at the festival, on top of thousands more fans watching via the live stream! 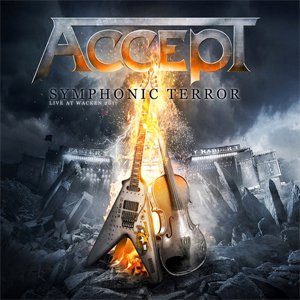 The show was divided into three parts, showing the full creative power of ACCEPT: The first part hosted the premiere of new tracks "Die By The Sword" and "Koolaid", as well as some of their most popular songs, such as "Restless And Wild" and "Pandemic". The middle part hosted guitarist Wolf Hoffmann accompanied by a symphony orchestra, presenting the best-of from his recent solo album Headbangers Symphony, which includes metal versions of some of the world’s biggest classical compositions (e.g. from Beethoven, Mozart, Vivaldi,...). And in the last but not least part, fans were able to bang their heads to ACCEPT anthems (also accompanied by the orchestra), such as "Princess Of The Dawn", "Breaker", "Fast As A Shark" and "Metal Heart", as well as to new songs like "Stalingrad", "Shadow Soldiers" or "Teutonic Terror". The finale could be nothing less than an 8 minute version of their eminent hit "Balls To The Wall"! 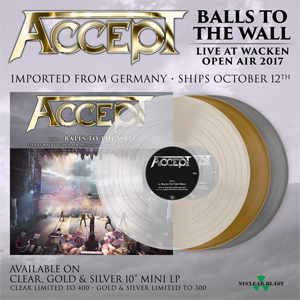 In advance, ACCEPT are releasing a very special, limited 10 inch vinyl single "Balls To The Wall"/"Symphony No.40 in G Minor", which will be released on October 5th. 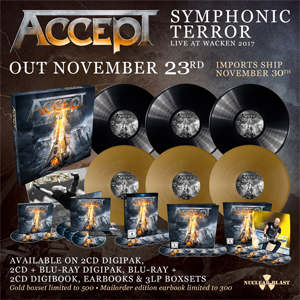 Both songs are from their upcoming live album Symphonic Terror – Live at Wacken 2017, which will be out on November 23rd. 02.10. USA - Dallas, TX - Gas Monkey Live! The flagship of German Heavy Metal, ACCEPT, are very pleased to announce the "Rise Of Chaos Festivals 2018" for the very first time. The events will take place in Germany. After the big success of their latest album The Rise Of Chaos, ACCEPT will be playing three “festivals” under the same name. As a platform for interesting, young and dynamic bands, these festivals will be established as a recurring event over the next few years, they will be presented by Continental Concerts to offer a live spectacle to all fans of Heavy Metal.